A few weeks ago we sat around the dinner table, full from a big barbecue and talking about our weekend when we heard a familiar tune. My husband and I heard it first and then our kids perked up. Anyone who was once (or is now) a kid would recognize it in an instant. It was a song playing in the tune of ice cream. Remember hearing that unforgettable tune echoing off the houses as you played outside in the summer? Remember running inside screaming for mom and dad to empty their wallets so you could get back outside in time to stop the ice cream truck as it drove by? Then there were the choices. Ice cream sandwiches, rockets, creamsicles. Such tough decisions for kids. This summer, Smucker’s wants families to rekindle those fond memories and bring back some of the ice cream truck classics in easy, inspired recipes that you can make at home. 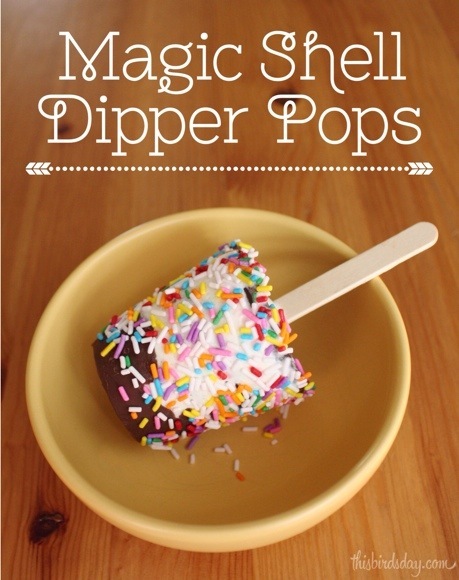 I ended up making some Magic Shell® Dipper Pops. I first combined the softened ice cream and Magic Shell® together in the individual cups. 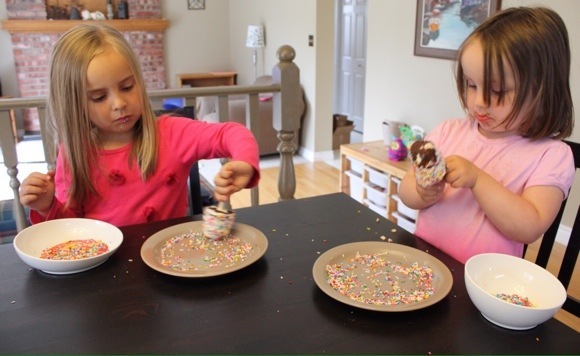 Then, when they were ready, my girls had fun rolling the dipper pops in sprinkles for the final touch. They were easy to put together, and the sprinkles covered any mishaps. The end result was gobbled up so fast I almost didn’t catch them in the act. Almost. Inspired by ice cream truck classics, this is the perfect summer treat that you can make at home. Place 1 tbsp (15 mL) Smucker’s® Magic Shell® on the bottom of 4 oz disposable cup. Top with ½ of ice cream, insert wooden stick and then top with 1 tbsp (15 mL) of Smucker’s® Magic Shell®, remaining ice cream and remaining Smucker’s® Magic Shell®. 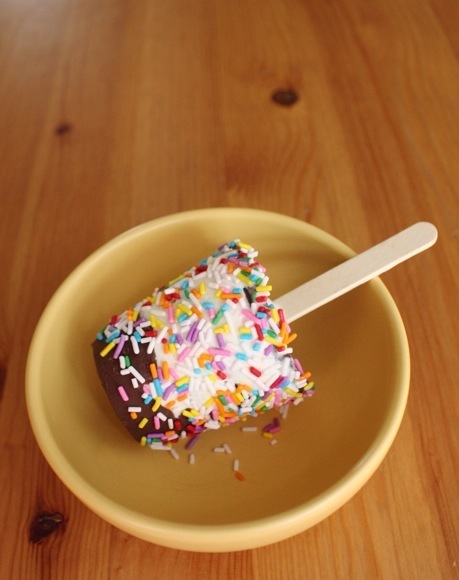 Cut cup away from ice cream and roll in sprinkles to garnish. This recipe is posted with permission from Smucker's. 'Cooking time' listed above is 'freezing time'. Out of all the Smucker’s ® Ice Cream Topping products I think our family-favourite is the Smucker’s® Magic Shell® Chocolate Flavoured Topping. Our kids can’t get over how quickly it hardens on ice cream. They kept asking for more to experiment with, but I have a feeling their request stems from it just tasting awesome, rather than being ‘in the name of science’. 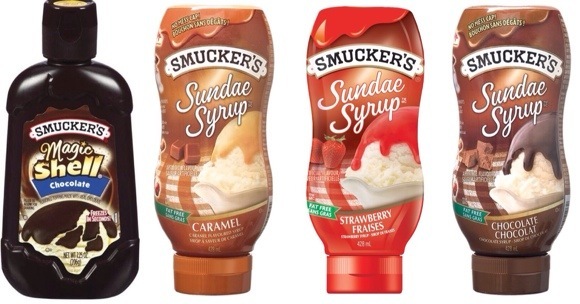 You can find everything you need for a summer filled with ice cream truck inspired frozen treats from Smucker’s in your grocery store, including Sundae Syrups™ in Strawberry, Chocolate and Caramel flavours. For inspiration on more ice cream treats, visit Smuckers.ca.